Spray 5-quart slow cooker with cooking spray. Set aside 3/4 cup of the pasta sauce. In medium bowl, mix cottage cheese, 1 cup of the mozzarella cheese, the cream cheese, Parmesan cheese, egg and pepper flakes. Heat 12-inch skillet over medium heat; add beef. Cook 5 to 7 minutes, stirring occasionally, until browned; drain. Add remaining pasta sauce (about 2 1/2 cups), 1/2 cup of the water and the whipping cream to the beef. Pour into slow cooker. Fill each uncooked pasta shell with rounded tablespoonful of cheese mixture. Place in slow cooker. Mix reserved 3/4 cup pasta sauce with remaining 1/4 cup water; spoon over shells. Cover; cook on high heat setting 1 1/2 to 2 hours or until pasta is tender. Sprinkle remaining 1/2 cup mozzarella cheese over shells. Cover; let stand 15 minutes. Any Muir Glen™ pasta sauce can be used in this recipe. 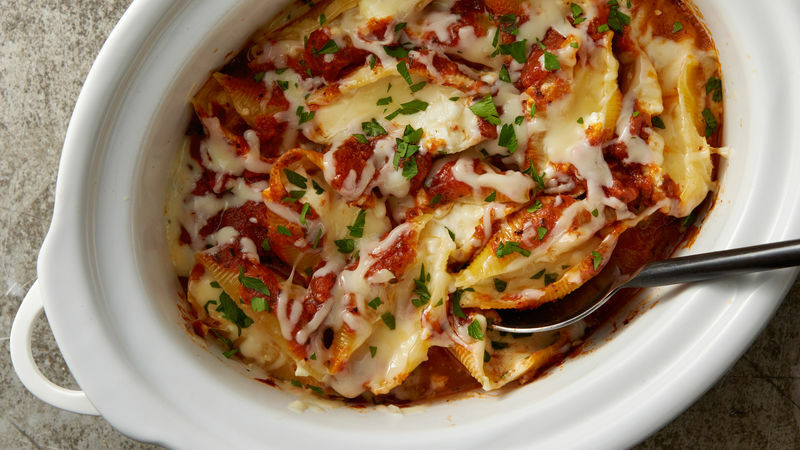 Most boxes of jumbo pasta shells will have more than the amount needed in this recipe. Look for the shells that are more open, as they will be easier to fill.